Famous Colleges Aside, It’s Easier Than Ever to Get into Good Universities, Study Shows - 24/7 Wall St. Among the things lost in the admissions scandal involving parents who paid money under the table to get their children into elite schools is that college is not that hard to get into. According to a new study, most colleges admit more than half of the applicants. 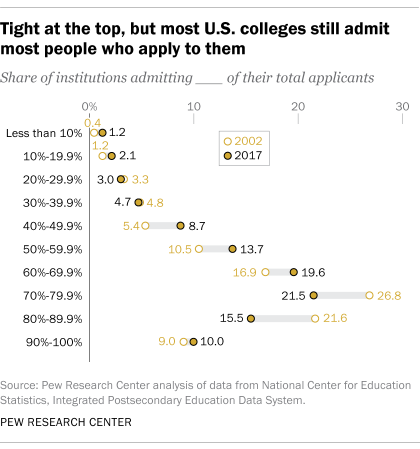 Pew Research examined application policies at 1,364 four-year colleges for the period from 2002 to 2017. Some 53% admitted more than two-thirds of annual applicants. This included some well-known schools: St. John’s University in New York (67.7%), Virginia Tech (70.1%), Quinnipiac University (73.9%), University of Missouri at Columbia (78.1%) and George Mason University (81.3%). None of these were on a list of the hardest colleges to get into by state.